Ideal for stowing the items needed for a one-day trip. Bottom is molded EVA, shaped for a snug fit on the fuel tank and with an anti-slip PU surface layer. Liner made of nylon fabric with PU coating. Waterproof with roll-and-seal closure with bayonet buckle and taped seams. Waterproof map compartment with anti-slip PU coating on the inside. Small water-repellent zippered outside pocket with bottle-holder function. A pull cord on the inside secures a 0.5 l water bottle where it is quickly accessible on a short stop. Carry handle and removable shoulder strap. R 1200 GS logo on side. 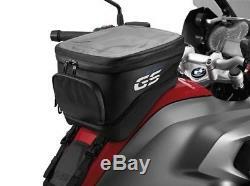 BMW R1200GS WC (13-) Small Tankbag. The item "BMW Motorcycle R 1200 GS Tank Bag Small R1200GS Tank Bag 77458559153 8559153" is in sale since Tuesday, July 3, 2018. This item is in the category "Vehicle Parts & Accessories\Motorcycle Accessories\Luggage\Other Luggage". The seller is "sytnercoventrybmw_mini" and is located in Coventry. This item can be shipped worldwide.